The first one comes from Great Divide (@greatdividebrew), which is currently one of my favorite breweries and one I try to pick up as much as possible when traveling to Houston or elsewhere. 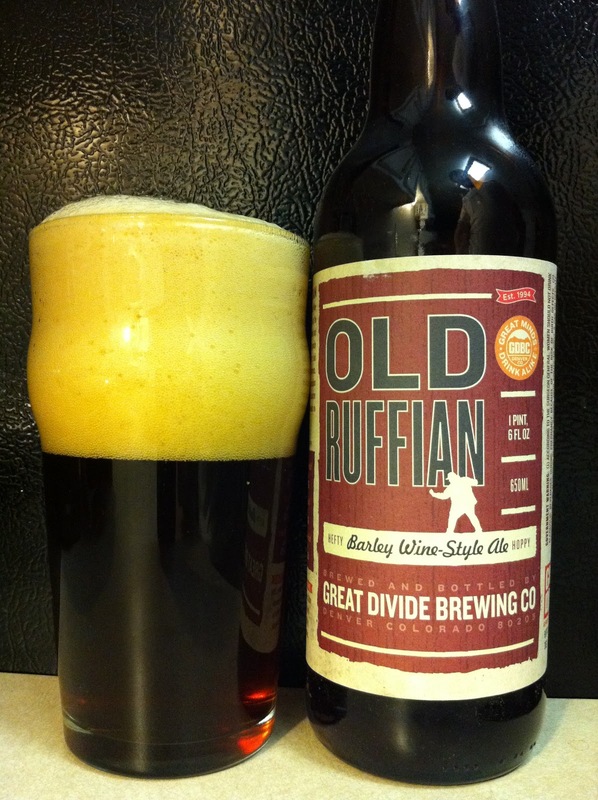 This one is their Old Ruffian Barleywine. I poured it from a bomber into an imperial pint glass... it's a copper color, clear with a large off-white head. A pretty decent looking beer. 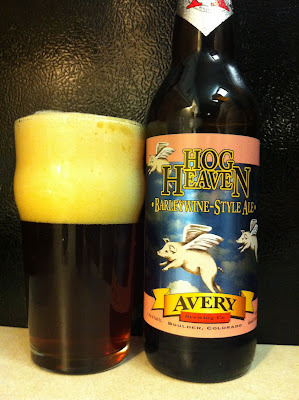 The aroma is boozy and malty, with hints of molasses and caramel. The flavor is insanely rich... boozy as well but so strong with the caramel and molasses flavors... it's a little overwhelming, but so delicious. Like a food that has so much flavor it's hard to concentrate on just one. It's tasty and exciting. I like this one a lot... not sure if it's going to be an A+ beer but it's an A at the worst. Second up, the Hog Heaven Barleywine from Avery Brewing (@averybrewingco), a second straight Colorado brewery. Just like the Old Ruffian, I poured the brew from a 22 oz. bottle into an imperial pint glass. It's a dark copper color with a frothy white head. It has great lacing and good retention... a solid looking beer! The smell is malty with a metallic hint to it... caramel and molasses dominate. The taste is a lot better than the smell... rich with the malt/hop flavors and boozy sweetness. I like the mouthfeel a lot, but that's pretty typical of barleywine or similarly high-gravity beers. Easy to drink... a solid beer but not quite as good as the Old Ruffian. Finally, a California barleywine, the Green Flash (@greenflashbeer) Barleywine Style Ale. 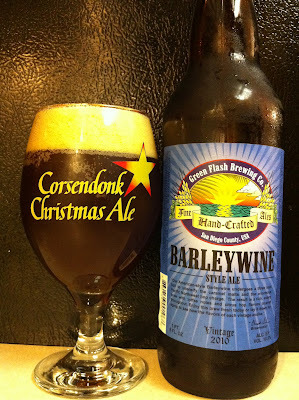 I decided to mix it up for this one, and poured from a bomber into a Corsendonk goblet as opposed to a pint glass. It's a murky brown color with an inch worth of bubbly slightly off-white head. Good retention and lacing on this one. It's a great smell, rich and malty. There is definitely a boozy note to it and lots of caramel and spice. The taste is way more bitter with the hops up front then a boozy kick followed by a warm caramel hint and the back to the hops on the aftertaste. Not bad, I guess the California thing is to add a little more hops, I know I've had the Sierra Nevada Bigfoot barleywine before and it's extremely hoppy for the style. I really like the layering of flavor in this one. Feels good on the mouth for sure. My overall impression, a strongly above average barleywine but not the best I've had. Better than the Avery offering but falling a little short of the Great Divide brew. In summary, all three were fantastic beers that I'd drink again. Now I just need to find a few more barleywines to try and keep expanding my knowledge of the style.